On Sunday 21st December 2008, we hosted “An Evening With Our World Champions”. 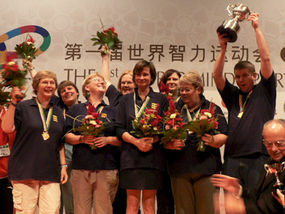 The entire World Champion English Ladies team from the recent 1st World Mind Sports games held in Beijing in October 2008 joined us here at the Acol Club for a 12 board session. The session was very much along the lines of the session we had with Andrew Robson earlier in 2008. During the play, the Champions chatted to the kibitzers and we gained an insight into their thought processes. It was most illuminating to see how World Champions think! We had over 250 people watching the event, including some expert English players who also commented to the kibitzers! I would like to thank the entire World Champion team for their contribution to a memorable evening. May I also thank JK and Sue for helping “behind the scenes”. Thanks to everyone at the club for coming along and supporting another brilliant Acol Club event!